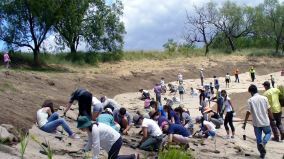 West Moreton Landcare Group received a $16,750 Everyone's Environment grant to restore a section of Lockyer Creek at the University of Queensland’s Gatton campus. Mobilising students during O-week the organisation engaged a total of 80 volunteers to plant a total of 2600 trees across one hectare. The project will help to stabilise the banks of the Lockyer creek, improving the creek’s resilience in future flood events, and provide habitat for birds, reptiles and other wildlife in the area.